OK...we have some friends coming and a bit of celebrating to do but I have time to post you a few quick pictures. 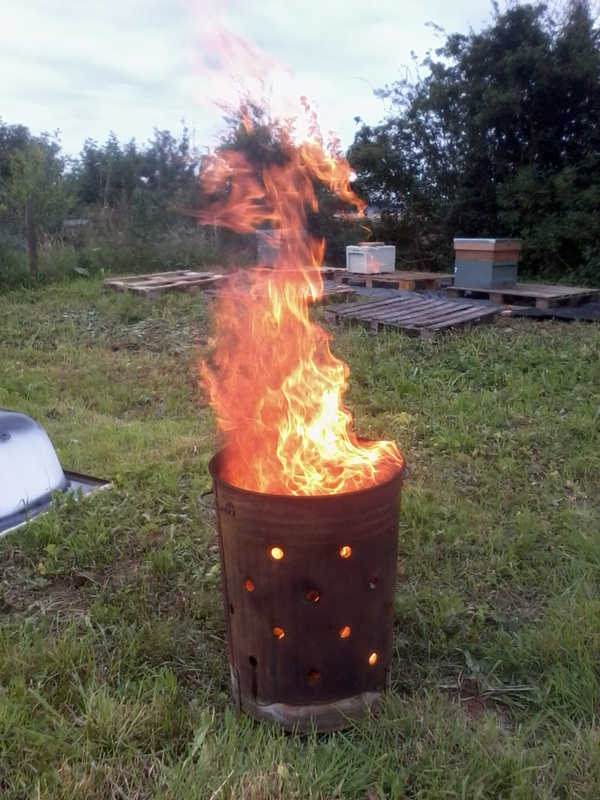 So first off I needed to burn this old hive that had been on the allotment for a long time and currently had no bee inhabitants but obviously could hold some sort of disease which I didn't want to chance my bees picking up. 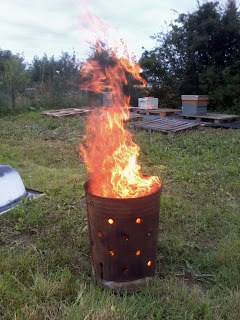 The hives parts and wax produced a very hot rapid fire!! 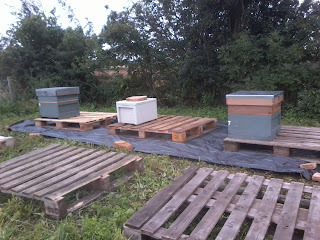 So here are the hives in place. Two wooden hives each with one super each containing stores of honey for the bees. In the smaller 'nuc' is a newer swarm which I will shortly move into one of my poly hives so they have more room. I will then give them more feed to give them chance to build more comb and collect more stores to improve their chances of surviving the winter. 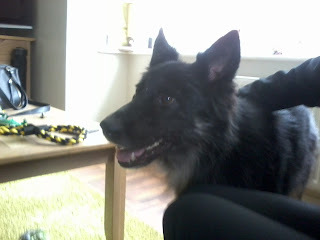 And the final picture is introducing you to Trojan. Hopefully all being well we will be bringing him home next weekend. I am excited about that as I was about getting my bees!!! Will try and catch up with everyone over the next few days but things are just so busy at the moment...kind of hoping for a calmer week. You have a lot of fun things going on! Looking forward to keeping up with your posts. Thanks Velva...it really is all happening at once! Trojan looks to be a real bright eyed character. He's a gem Sue...going to be a huge hit with the family! very exciting with the bees. A whole new venture and I look forward to hearing how it goes. 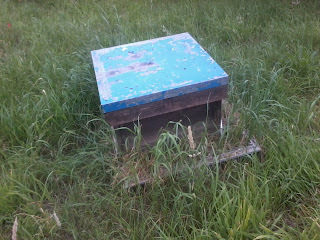 The bees are going great...I will hopefully be giving an update and some pic's inside the hives this week. Wow, you've got such a lot going on at the moment, all very exciting. It was three years ago yesterday that we got Archie, it's the best thing we ever did, they just fit right in to the family. I'm sure Trojan will be just the same. Is he a German Shepherd or does he have some German Shepherd in him? I can't wait to hear more about him. He's a German shepherd border collie cross Jo. It is a while since our Tessa passed away so it will be strange getting used to having a new dog but He is going to be VERY loved!! Exciting times! Have a good week! Trojan looks great! I'm sure he's going to be a gentle giant as some of our relatives have had these lovely dogs. He certainly is too soft for his own good sometimes. Absolutely perfect! Dear Tanya, I hear both the excitement and the rapid pace you are keeping in your voice. I hope that your visit with your friends and the celebrating will give you time to relax and take a breath. Though I know that the excitement is happy and of course that is good and energizing. I am very happy for Trojan. He has found love and comfort with you and your home. We had a great evening with friends Catherine and life is good if not way to hectic. As routines come back into place though things will quieten down a little and give me more time for everything else!! Dear Tanya, Good luck with the bees! I hope you get lots of delicious and healthy honey. I am so happy for you and your family to be getting "mans best friend" Tojan. He is very fortunate to be part of your family. You will be his "best friend" too. You are very kind and caring. Bees are settling well, as is Trojan now he's home with us to stay. Life settling down now. No honey until next year but I am very much looking forward to that very first taste!! Trojan, what a great name! And bees too, very exciting!! Can't take credit for his name Damo, but I think it's great for him too and very fitting. Bees are exciting and a little bit scary at times! !